The autobiography every true American has been waiting for: a shockingly candid and raw confessional from a national treasure. From his humble beginnings in a desolate Iowa coal mining town, his years at Our Lady Queen of Chewbacca High School to his odds-defying climb to the dizzying heights of becoming America’s most trusted and beloved television News Anchor, Ron Burgundy pulls no punches in Let Me Off at the Top! In his very own words Burgundy reveals his most private thoughts, his triumphs and his disappointments. His life reads like an adventure story complete with knock down fights, beautiful women and double-fisted excitement on every page. He has hunted jackalopes with Bobby Kennedy and Peter Lawford, had more than his share of his amorous exploits, and formed the greatest on-air team in the history of televised news. Along the way, he hobnobbed with people you wish you knew and some you honestly wish you didn’t — celebrities, presidents, presidents’ wives, celebrities’ wives, dogs, and, of course Veronica Corningstone, the love of his life. Walter Cronkite, Barbra Streisand, Katie Couric, the list goes on. Who didn’t Mr. Burgundy, or “Ron” as he is known to his friends, rub elbows with in the course of his colorful and often criminal life? This may well be the most thrilling book ever written, by a man of great physical, moral and spiritual strength and not surprisingly a great literary talent as well. This book deserves a real shot at a Pulitzer Prize. In fact if it doesn’t win one then we will finally have proof that the Pulitzer is rigged. 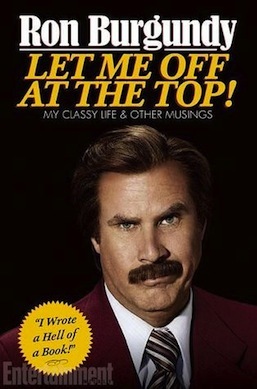 Ron Burgundy has taken the time to write a book. We owe it to him, as honest Americans, to read it. WHY WE’RE EXCITED: WE’RE IN A GLASS CASE OF EMOTION!!! This standalone e-only short story illuminates the life of the enigmatic Magnus Bane, whose alluring personality populates the pages of the #1 New York Times bestselling series The Mortal Instruments and The Infernal Devices. 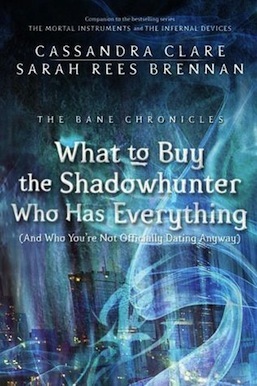 This story in The Bane Chronicles, What to Buy the Shadowhunter Who Has Everything (And Who You’re Not Officially Dating Anyway), is written by Cassandra Clare and Sarah Rees Brennan. You think you know her story. You’ve read the Brothers Grimm, you’ve watched the Disney cartoons, you cheered as these virtuous women lived happily ever after. But the lives of real princesses couldn’t be more different. Sure, many were graceful and benevolent leaders—but just as many were ruthless in their quest for power, and all of them had skeletons rattling in their royal closets. Princess Stephanie von Hohenlohe was a Nazi spy. Empress Elizabeth of the Austro-Hungarian empire slept wearing a mask of raw veal. Princess Olga of Kiev murdered thousands of men, and Princess Rani Lakshmibai waged war on the battlefield, charging into combat with her toddler son strapped to her back. 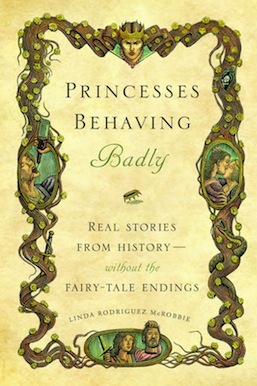 Princesses Behaving Badly offers minibiographies of all these princesses and dozens more. It’s a fascinating read for history buffs, feminists, and anyone seeking a different kind of bedtime story. WHY WE’RE EXCITED: We talk at length about it in our review of this historical novel that takes a look at princesses who have no desire to fall asleep and wait around for true love’s first kiss.